BC Budivelnik Kiev became the Last 16 Group I champion by downing BC Triumph Lyubertsy 88-77 in the Ukrainian capital on Wednesday. Budivelnik won Group I with a 4-2 record and will face Spartak St. Petersburg in the two-game Eurocup Quarterfinals. Triumph finished fourth with a 2-4 record. 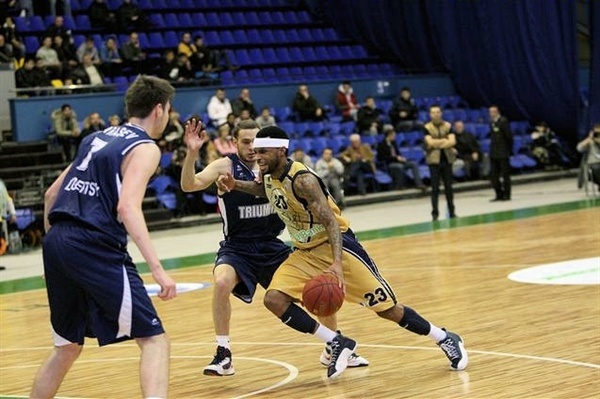 Malcolm Delaney paced the winners with 26 points by making 16 of 16 free throws. 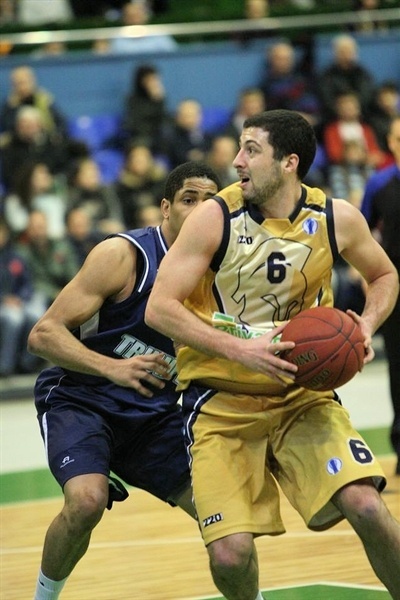 Michail Anisimov added 16 points, Giorgi Tsintsadze had 14 and Artur Drozdov 13 for Budivelnik. Tywain McKee led Triumph with 17 points. Sergey Karasev added 15 and Kyle Landry 10. Budivelnik had a strong start, but Landry and McKee fueled an 0-8 run that gave Triumph a 9-12 lead. An outstanding Delaney helped the hosts tie the game, 21-21, after 10 minutes. A 0-7 run that Sergey Karaulov capped with a jumper helped Triumph restore a 21-28 lead. McKee boosted the guests' margin to 29-38, but Delaney and Drozdov kept Budivelnik within 39-43 at halftime. Tasamin Mitchell gave Triumph a 43-51, howver Budivelnik held its opponents scoreless for the next six minutes. Meanwhile, Delaney and Anisimov combined for 11 points in a 15-0 run that gave Budivelnik a 58-53 edge after 30 minutes. Yuval Naimy got Triumph going with a jumper but Tsintsadze and Drozdov combined for all points in a 9-2 run that gave Budivelnik a 9-4 edge. Landry hit consecutive jumpers in an 0-8 run that Karasev capped with a fast break layup that made the hosts call timeout at 9-12. Anisimov and Landry traded baskets and free throws by Delaney kept Budivelnik within 13-14. McKee downed a three-pointer, Rihards Kuksiks nailed a jumper and a driving layup by Naimy gave Triumph a 15-19 edge. Delaney sank 4-of-4 free throws, Artem Vikhrov scored in penetration and a jumper by Dainius Salenga tied the game, 21-21, after 10 minutes. Karasev struck from downtown and Vikhrov added a wild put-back dunk in a 0-7 Triumph run that Karaulov capped with a close jumper for a 21-28 score. Anisimov made free throws that Artem Kuzyakin improved with a triple. Delaney and Sergiy Gorbenko stepped up with consecutive baskets but a layup by McKee and a jumper by Mitchell restored a 27-34 Triumph edge. Gorbenko scored agin but Valiev and Mckee made it a nine-point game, 29-38. Delaney struck from downtown, Karaulov swished a jumper and a close basket by Anisimov kept Budivelnik within 34-40. Drozdov and Karasev traded triples and a free throw by Anisimov fixed the halftime score at 39-43. Landry scored around the basket right after the break but free throws by Delaney and a jumper by Drozdov brought Budivelnik within 41-45. Mitchell shined with a second-chance layup and Landry soon made it an eight-point game, 41-49. Leo Lyons and Mitchell exchanged baskets but Budivelnik improved its defense. Meanwhile, Anisimov scored twice around the basket, Salenga struck from downtown and an unstoppable Delaney had 7 points in a game-changing 16-0 run that Tsintsadze capped with a free throw to give Budivelnik a 58-51 lead. Triumph went scoreless for almost 6 minutes and free throws by McKee only brought the guests within 58-53 after 30 minutes. Karasev hit a jumper early in the fourth quarter but consecutive layups by Anisimov and Tsintsadze boosted the hosts' lead to 62-55. Anisimov scored again but Mikhail Kulagin and Karasev kept Triumph as close as 64-59. Drozdov fired in one from downtown and soon added a wild alleyoop slam that to keep Budivelnik way ahead, 60-51, with over 4 minutes left. Karasev and McKee kept Triumph within 74-69 with 3 minutes left. Tsintsadze and Delaney made free throws that sealed the outcome, 80-69. Triumph kept trying but all Budivelnik fans were celebrating that their team will keep fighting for Eurocup glory!